May Belle Hinson is my grandfather Wallace Paul Cowan’s aunt, sister to his mother Myrtle Bertie Hinson (1879-1971). She was the 4th of 10 children of Isaac Newton Hinson (1849-1925) and Louisa Cumi Harp (1852-1918). You can read about their family here. Belle was born September 24, 1977 in Whitener, Arkansas. On the 1880 US Census Belle was listed as Emily M Hinson, age 3. In 1884, Belle’s brother Zimri died. In 1887, her brother Polk died. She married Robert Blake Baggett in Washington County, Arkansas on December 24, 1897. She was 20 and he was 26. Their daughter Winnie was born in 1901, their son Ray was born in 1904, and their daughter Theda was born in 1907. Shiloh Museum of Ozark History has this photo in their archives and provided me with information. It was taken at the Baggett residence in Springdale around 1904. The man in the middle row to the left of Cumi is Blake Baggett. With this identify confirmed, I think he’s holding his daughter Winnie, who was born in 1900, and I believe that is his wife Belle standing behind him to the left. Ada and her husband Andrew are mismarked as Mr. & Mrs. A. G. Sanders. I haven’t identified all the people in the photo but Ada’s mother Cumi is in the center and her father Newton is marked G. Father Hinson. Seated in buggy is Ada and her mother Cumi. Standing, right to left are Belle, probably her daughter Theda, then my grandfather Wallace Paul Cowan and Mrs. Gramblin and Faye. I thought Mrs. Gramblin and Faye were neighbors but I can’t find them on a census. In 1912, their daughter Ada was born. In 1918, Belle’s mother died. In 1919, her son Ray died. In 1920, her sister Vernie died. On the 1920 US Census, Belle was 42 and Blake was 48. Blake’s occupation was farmer and industry was “home farm.” They lived in Springdale. Theda was 12 and Ada was 8. In 1925, Belle’s father died. May Belle on the left, her sister Dora Ada on the right. On the 1930 US Census, Belle was 53 and Blake was 59, living in Springdale, Arkansas. Ada was 18. Blake was a Laborer at the gas company and Ada was a Saleslady at a variety store. In 1945, Belle’s brother Mack died. In 1946, her sister Cleopie died. In 1949, her brother Dan died. In 1952, her brother Lin died. In 1959, her sister Ada died. At this point, her only living sibling was her sister Bertie, and they are pictured below. Blake died February 13, 1969 and Belle followed on October 26, 1970. They are buried in Bluff Cemetery in Springdale. Their Find A Grave memorials are here. Winnie G. Baggett – Winnie was born October 12, 1900. She married John L. Main of Sebastian County, Arkansas on July 27, 1919 in Washington County, Arkansas. They had 4 children. She died January 14, 1983. Her Find A Grave memorial is here. Andy Ray Baggett – Ray was born July 10, 1904 and died January 17, 1919. His Find A Grave Memorial is here. Ada Catherine Baggett – Ada was born August 16, 1912. She married Harold Jenkins in Springdale, Arkansas on November 23, 1932. They had 2 children. She died February 15, 2010. Her Find A Grave memorial is here. 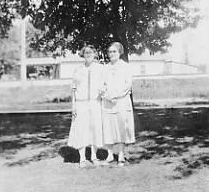 This entry was posted in Hinson Family History and tagged Andy Ray Baggett, Calvin Thomas Collins, Dora Ada Hinson, Faye Gramblin, Fern Eugene Moore, Genealogy, Isaac Newton Hinson, John L. Main, Louisa Cumi Harp, Mark Harold Jenkins, May Belle Hinson, Myrtle Bertie Hinson, Robert Blake Baggett, Springdale Arkansas, Theda Gail Baggett, Wallace Paul Cowan, Washington County Arkansas, Winnie G. Baggett by fillinginthefamilytree.com. Bookmark the permalink.